In the decade since the launch of sE Electronics’ original Reflexion Filter, the ‘portable vocal booth’ concept has grown so much that it now forms a market segment all of its own, and there are plenty of options from which to choose. 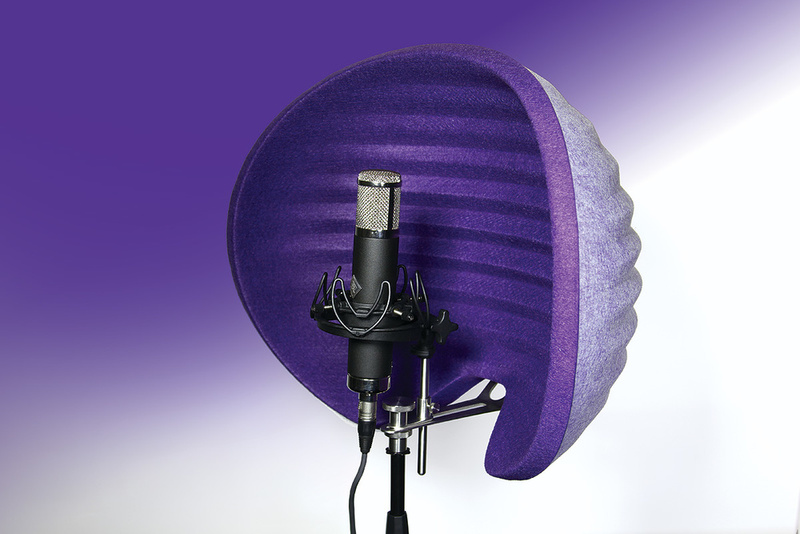 The aim of all these products, of course, is to help avoid capturing unwanted room sound when recording. Regular readers might remember that, back in September 2014, we carried out a group test (http://sosm.ag/vocalbooths-article) which demonstrated that there’s an inevitable trade-off: all such devices add at least some coloration. So if you’re recording in a great-sounding room, maybe you don’t need one. But, importantly, I find that the degree of coloration from well-designed filters is vanishingly small, and in a typical home/project studio, it’s far less significant than the room sound they remove. You need to let your ears be the judge, but there’s no doubt that they can be very useful tools. One of my main concerns about the vast majority of existing solutions is that, as they’re open at the top and bottom, they do little to counter ceiling or floor reflections. Some products, such as the Kaotica Eyeball, provide more of an all-round screening solution, but with the ‘shield’ being very close to the microphone in that design, this comes at the expense of greater tonal coloration. All of this brings me neatly on to Aston Microphones’ Halo, the latest entrant to this market, because the Halo has been designed to tackle the floor/ceiling issue, while avoiding the heavier coloration of designs like the Eyeball — and, to my ears, they’ve succeeded. I’m told that Aston spent quite some time on research and development, evaluating the pros and cons of different existing products, exploring the properties of different materials and so on. For the absorption, they settled on a hi-tech acoustic PET (polyethylene terephthalate) felt. Seventy percent of this material is recycled plastic that’s subjected to a special process to form a porous, rigid felt. The overall shape is somewhat shell-like, wrapping around on all sides other than in the centre of the lower edge, where the support arm is fixed. Thanks to the PET felt, the Halo is very light in weight and this allows it also to be physically fairly large (54cm wide and almost 9cm thick at the centre). Thus, the mic is placed slightly further away from any of the reflective surfaces than on many similar designs — and that neatly gets around the coloration issue that I mentioned earlier, in relation to the Eyeball. The only downside is that this all means that the Halo a little bulkier than most and can’t be folded away; when not in use you’ll need space to store it. There are three layers of felt, which is a rather nice pale-purple colour. The front sheet and back sheet are the same, but the gap in between is filled with a lighter version. The ‘gap’ helps to improve handling of lower frequencies. The inside of the Halo is ribbed, so that any reflections that do come back from it are scattered to some extent. These ridges will only work at high frequencies, of course, but that’s all of any significance that’s likely to be reflected back, and even then only a little. The stainless-steel mounting hardware is engineered in the UK, and includes a cable tidy. Simple stand mounting is accommodated via a US thread, and there’s plenty of flexibility in setting the mic position, both in distance from the screen and in height. It is also surprisingly well balanced, sitting over the centre of gravity of the mic stand, so far less likely to topple than some products we’ve looked at, the original sE Reflexion Filter being one (though this was addressed in some later variants). I tested the Halo for a vocal recording session (there’s no reason it can’t be used for other sources) and found it easy to set up and easy to adjust. It proved very effective in screening out room ‘live-ness’ but, as with all other such devices, if you are working in a seriously bad room, then you should also put a further large absorber behind the vocalist — a foam panel or a polyester duvet would do the job. This is to intercept reflections from the wall behind that might otherwise find their way into the open side of the screen, and onto the hot side of the mic. My own studio is fitted with basic acoustic treatment, so I used the Halo on its own. The subjective results were perfectly clean; I could discern no audible coloration. Though I was acquainted with the specs beforehand, I was still surprised when setting it up at just how rigid and lightweight the structure is. I found it to be perfectly stable when placed on a dedicated bog-standard mic stand (ie. on a different stand from the mic), and the extra isolation this produces is definitely worth it. I’ve been impressed already by Aston’s microphones, and the first of their accessories is no different. In fact, I think the Halo sets a new bar for personal vocal booths: the large, lightweight shell-shaped design and the felt material combine to make it very effective. Sure, its size and shape mean it isn’t the easiest thing to store if you’re in a small room, but that’s a very small price to pay for something that works so well. Highly recommended. Controls floor and ceiling reflections. Subjectively very little colouration — at least as uncoloured as anything else out there. Lighter than similar quality competition. Very stable on its mount. About 25% larger than the sE Electronics Reflexion Filter. Size and shape means it requires more space than most to store. The Halo may not be the first design to control floor and ceiling reflections, but it’s much more transparent than the others that do this. It delivers impressive results, and is also very easy to mount.